Chelsea, Michigan is a thriving small city in southeastern Michigan with an abundance of shopping, dining, entertainment, music, theatre, outdoor recreation and local events. Recently named to the National Register of Historic Places, the remarkably intact historic architecture of our downtown and quaint Victorian neighborhoods contribute substantially to Chelsea’s charm, walkability, and sense of community. The Chelsea Historic Walking Tour maps are available at the Chelsea Area Chamber of Commerce and the Chelsea Historical Museum. 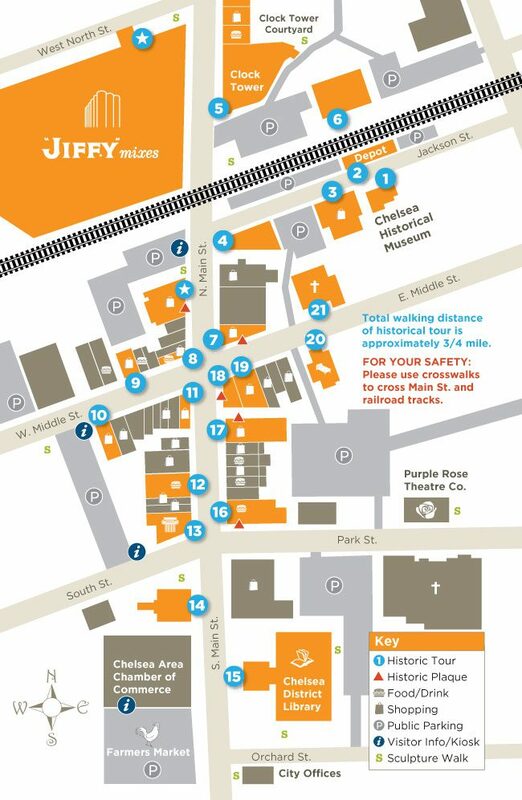 These maps were made possible through funding from the Community Tourism Action Plan (CTAP) Program and developed by the Chelsea Area Chamber of Commerce, ChelseaMich.com, Preservation Chelsea and the Chelsea Area Historical Society. You will also find historic plaques located throughout downtown. They are marked on the map below with a red triangle. Click here to view the historic maps. 1. Chelsea Historical Museum; 128 Jackson St. 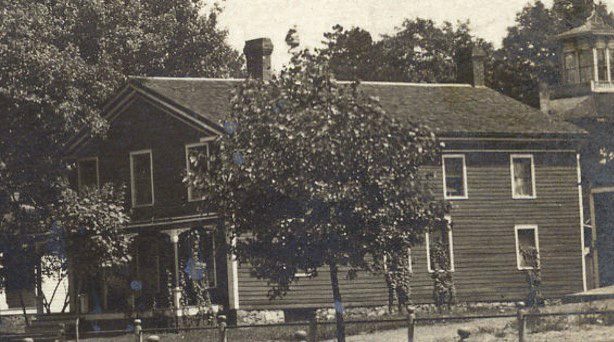 The Mial M. Boyd House is one of the oldest houses in Chelsea and was built and occupied by wagon maker Mial M. Boyd. 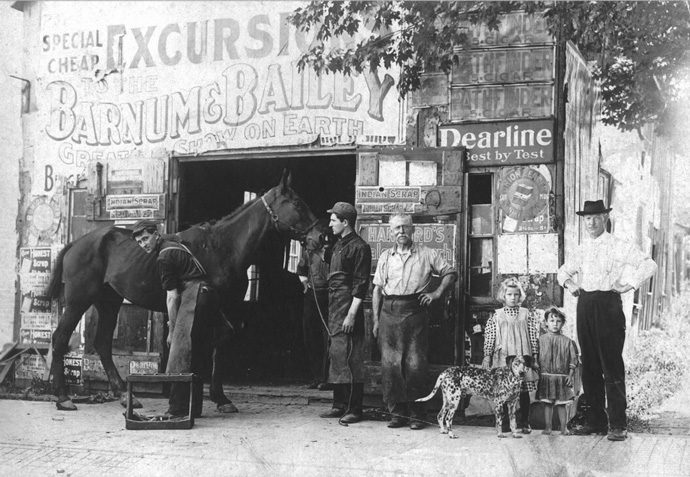 His wagon shop was located on North Street. Most recently, the Chelsea Area Historical Society and Museum call this home. Come in and learn more about Chelsea’s rich history! Open Thursdays and weekends. See chelseahistory.org for hours. 2. Chelsea Train Depot; 125 Jackson St. 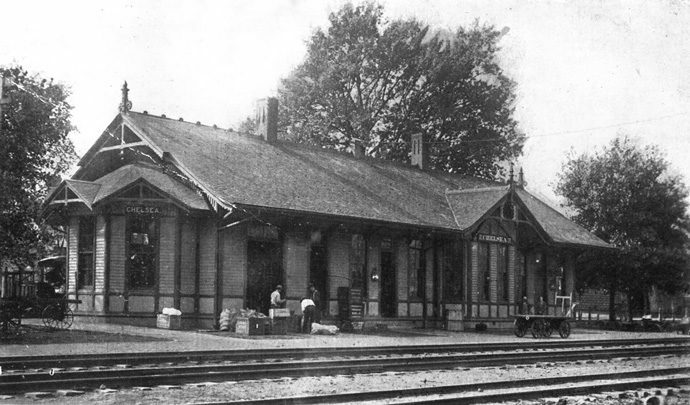 Built by Michigan Central Railroad in 1880, the Chelsea Train Depot replaced an 1850 station that was destroyed by vandalism and fire. Triple-gabled bay windows on both ends offered views of incoming trains by both the station agent and passengers. It remained in service until the early 1980s. For several decades wool was shipped by train from Chelsea to all parts of the country, making it one of the largest distributors of wool in America. Since 1986, the Chelsea Depot Association has owned and maintained the depot as a community center, and you can rent it for your next party or special event. 3. Chelsea Farmers Supply; 122 Jackson St.
Once located on Main Street as the Old Hotel or Chelsea House Hotel, this is one of the oldest commercial buildings in downtown Chelsea. After it was moved to the present location in 1889, it was converted into a boarding house. In 1926 it became a feed grinding mill and was operated first by miller Ransom Lewis followed by Anton Nielson until his retirement in 1989. Then it was sold to the present owners who continue to operate it as a feed store (without the grinder). Come in and see a one horse sleigh, have a soda, and experience an old fashioned farmer’s supply destination. 4. Mack Building; 110 Jackson St. 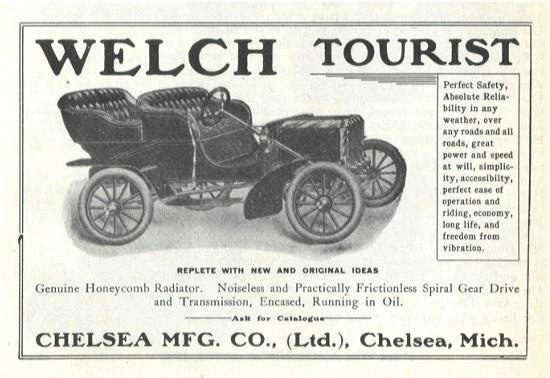 This was the home of the Chelsea Manufacturing Company led by entrepreneur A. R. Welch who built several Welch autos here in 1903. Warren Daniels, a Buick and Oldsmobile dealer, later added an Art Moderne car showroom in 1947 (demolished in 2013) seen to the right of the Mack in this photo. In 1952, Longworth Plating, a chrome plating business, purchased the old horse livery (demolished in 2014) that was to the left of the Mack, and operated in all three buildings, until the end of the 20th Century. Heydlauff’s Appliance; 113 N. Main St.
From the Mack Building, if you look across Main Street, you can visit the location of our first historic plaque on Heydlauff’s Appliance Store. This was once the site of the Glazier Stove Co. Office two story building. In 1943, Lloyd Heydlauff and Lewis Bernath purchased it and opened Frigid Products. Frigid Products closed after the building was destroyed by fire in 1970, but Heydlauff’s Appliance opened soon after in the building you see today. 5. Clock Tower; 310 N. Main St. In 1891 Frank P. Glazier hired Jackson-based architect Claire Allen to design the Glazier Stove Works that shipped “Brightest and Best” oil stoves all over the United States and South America. 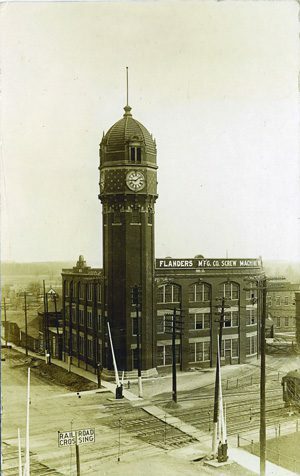 By 1907, the Clock Tower overlooked 18 buildings in a 10-acre industrial complex. The Clock Tower housed a 30,000 gallon wooden water tank that supplied water to fire sprinklers throughout the entire complex. Chelsea Milling Co.; 201 W. North St.
As you look across Main St. you will see the towering silos of Chelsea Milling Company, founded in 1901. “JIFFY” was introduced by Mabel Holmes in 1930 with her biscuit mix. 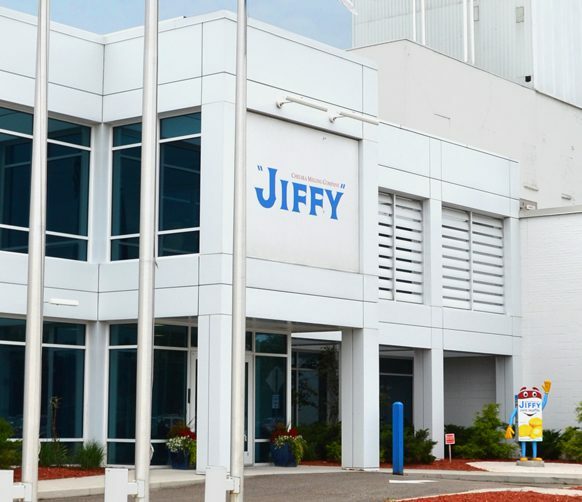 All “JIFFY” products shipped around the globe are made here in Chelsea. Call (734) 475-1361 to schedule a tour at this fascinating and historic family owned company. 6. Welfare Building; 300 N. Main St. Since Chelsea was a farm community, it lacked sufficient local factory laborers. 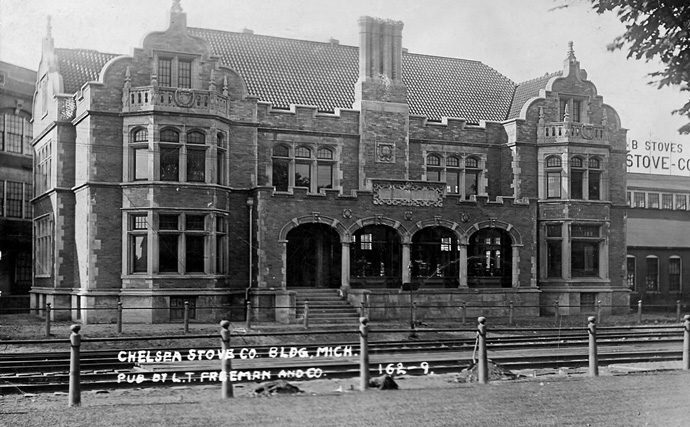 Many of the Glazier Stove Company workers commuted from Detroit to Chelsea during the week by train or interurban railroad and lived in local boarding houses. During the week the workers needed something constructive to do after work. This Welfare Building, designed by Claire Allen, was a recreation facility for these workers and featured a swimming pool, billiard room, basketball court, theatre and reading room. 7. La Maison; 104 N. Main St.
During a 1980s building renovation the McKune Block’s vintage façade, originally designed by local architect Art Lindauer, was restored. Steps to the second floor once ascended through a center entry, and the two entrances allowed for double business occupancy. The building was nearly condemned in the early 1980s, but was saved and restored by Sam and Joyce Johnson. 8. Zou Zou’s Café; 101 N. Main St. 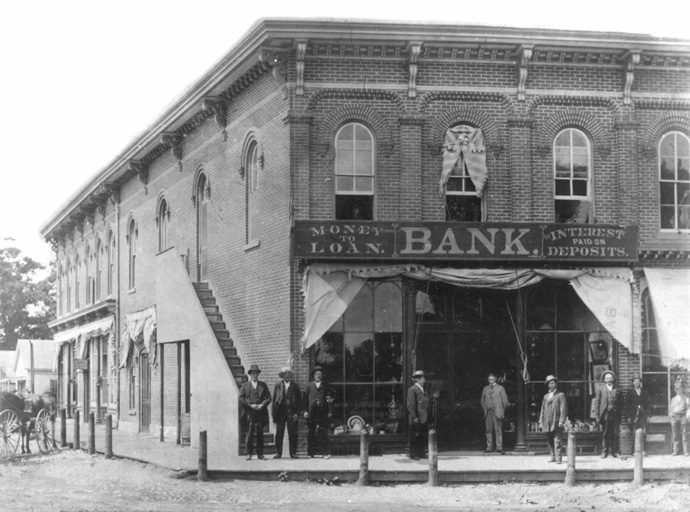 The Glazier Bank Drug Store housed Chelsea’s first bank and included a drugstore near the front entrance. A Palladian entrance was added in the 1930s when it was Burg’s Drugs. 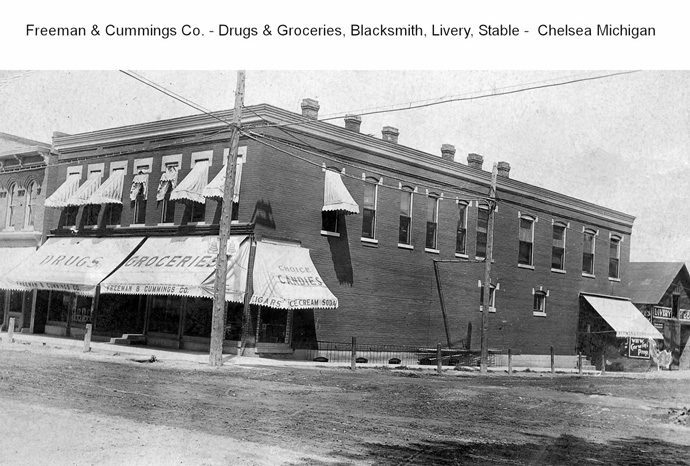 By the time Chelsea Pharmacy occupied this building, it had been Chelsea’s corner drug store for over 90 years. Step inside and taste some delicious fresh baked goods made daily by Zou Zou’s Café. 9. The Potting Shed; 112 W. Middle St.
As one of Chelsea’s first publicly funded structures, the Opera House served as the seat of local government. A 400-pound bell in the cupola called locals to meetings, events and elections. 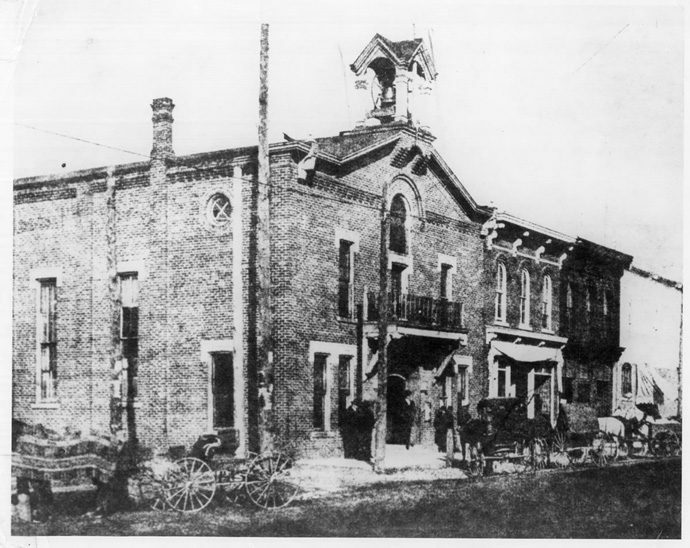 A large room with a stage and balcony provided space for not only Vaudeville acts, operas and social gatherings, but basketball games and boxing tournaments. Voters continued to cast their ballots here until 2000. To the right, you can see Seitz’s Tavern, which was built in 1876 by C. Klein. George Seitz moved his bar business across the street to this location in 1928. Come inside and see the original historic 23-foot-long solid cherry bar which is one of the last stand-up bars in Michigan. The porcelain enameled facade has remained in place since the late 1940s. 10. Global Marketplace; 115 W. Middle St. Stepping inside the old Hirth Blacksmith Shop you can still see the embedded iron rings on the walls installed by blacksmith Simon Hirth to secure horses. Later, when occupied by Farrel’s Sheet Metal, a new finial for the top of the Clock Tower was made here. Come in and shop for fair trade products from around the world. 11. Chelsea Print and Graphics; 102 S. Main St. This building has a modern white pressed roman brick veneer. 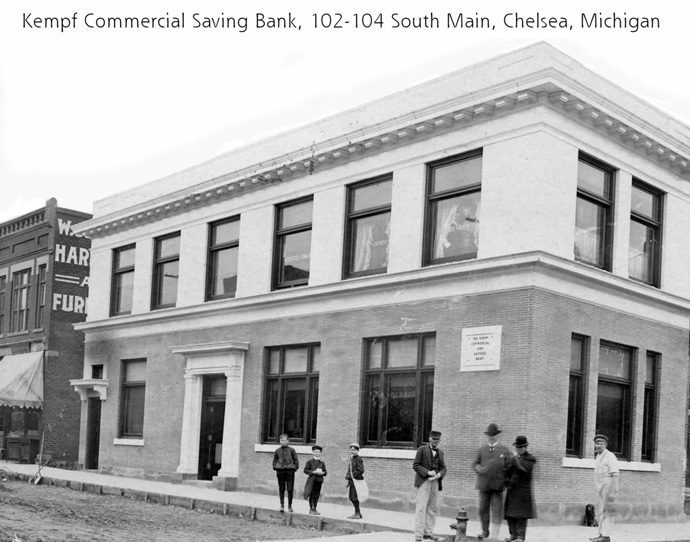 It was originally the home of Kempf Commercial Savings Bank which merged in 1934 with Farmers and Merchants Bank to form today’s Chelsea State Bank. Formerly it served as the Post Office, Library, Groves 5¢ & 10¢, and the Secretary of State. 12. The Common Grill; 112 S. Main St. 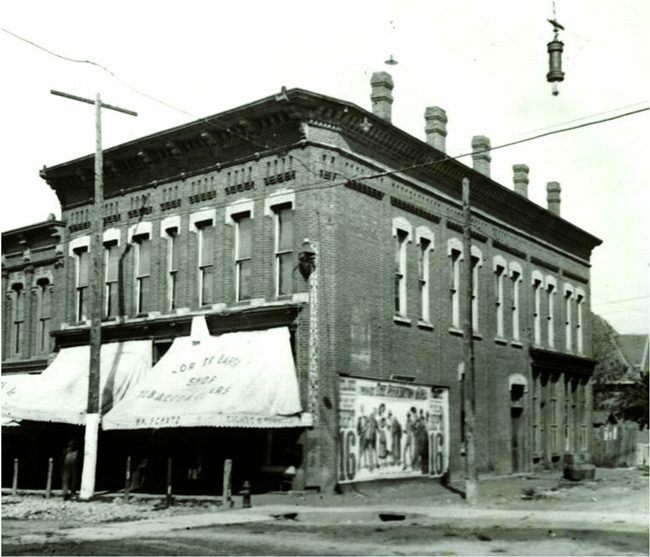 In 1893 William P. Schenk and Co. built and established the W.P. Schenk Department Store, one of the largest in the area at the time. 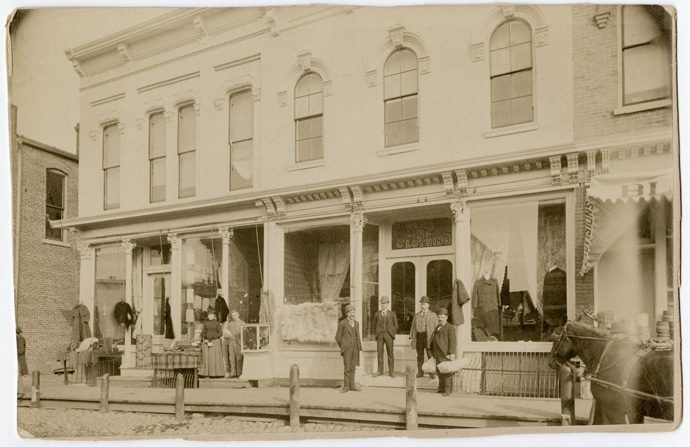 Three clothing stores followed in Schenk’s tradition – Glick’s, Anderson’s and Dancer’s. In early 1990, Dancer’s Department Store closed, and Craig Common opened The Common Grill Restaurant. Stop in for some great food and see an original 1896 exterior advertisement for Jaxon Soap on the south wall. 13. 14th District Courthouse; 122 S. Main St. 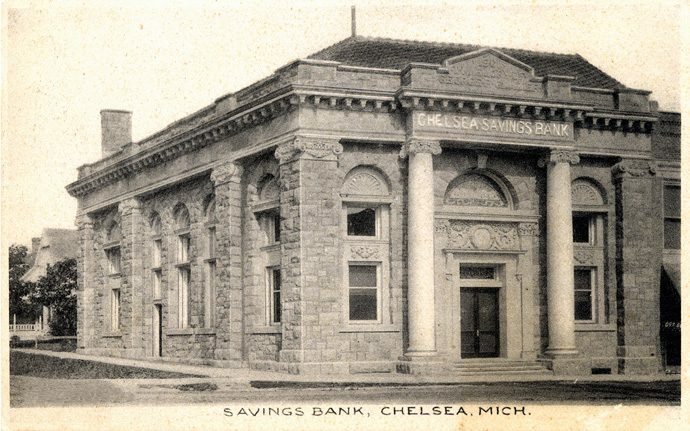 In 1901, Frank Glazier hired architect Claire Allen to design the Chelsea Savings Bank as a memorial to his father, George Glazier, Chelsea’s first banker. The exterior is clad in Bedford limestone and granite cut and laid by Chelsea stone masons. Two solid sandstone columns support the massive entablature and terracotta tile roof. A carved stone memorial wreath is visible above the entrance. 14. Old Chelsea Post Office; 204 S. Main St. 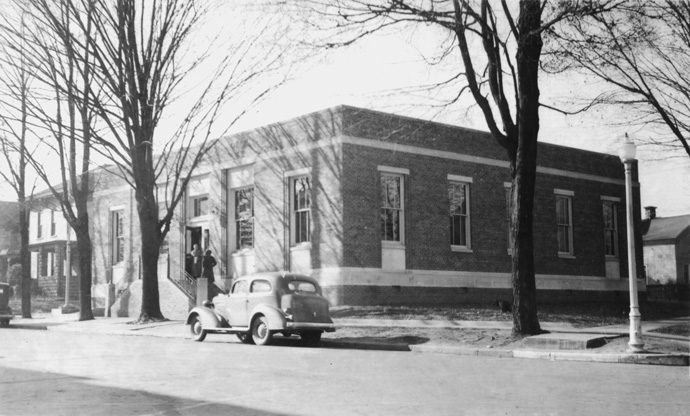 The construction of the Chelsea Post Office was a Depression era federal work project. If you look up you can see three stone panels decorated with images of a train, plane and ship. These carvings depict the three major modes of transportation used by the Postal Service. The Chelsea Post Office moved from this location to south of town in 2009. 15. Chelsea District Library; 221 S. Main St.
Chelsea founder Elisha Congdon’s house was built in 1860 and he lived here with his family until 1867. 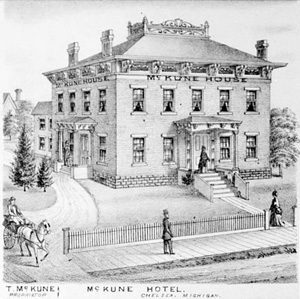 Timothy McKune purchased the home after Congdon died and used it as a hotel and boarding house. McKune’s descendants willed it to the Village in 1958 for use as a library. A major renovation to the Chelsea District Library was completed in 2006. Step inside and see some great pictures of Chelsea’s past on the staircase walls. Across the parking lot and behind the library is the Chelsea First United Methodist Church designed by Clark and Munger in 1899. Outstanding features include a bell tower, stepped parapets and a rosette stained glass window. Its Romanesque and Gothic style stone sanctuary replaced the original 1859 wooden church that was destroyed by fire. Exterior cut field stones were donated by area farmers. 16. Smokehouse 52 BBQ; 125 S. Main St.
For more than 120 years, a variety of stores have occupied this building including Schneider’s Grocery, a pharmacy, deli and meat market, and telephone company. Beginning in 1928, local families Schneiders, Kursterers, and later the Flintofts, owned and operated grocery stores here until 2010. Enjoy some “JIFFY” cornbread with your BBQ at Smokehouse 52. 17. Vogel’s & Foster’s; 109 S. Main St.
Vogel’s & Foster’s, developed by Harmon S. Holmes Chelsea Milling Company founder, had its beginnings as Holmes Mercantile, a clothing and dry goods store and is considered one of the oldest department stores in the area. 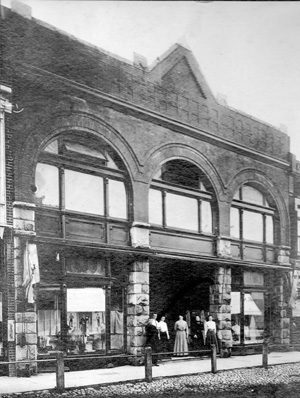 Today’s name was handed down from two longtime owners – Helen Vogel, who sold women’s clothing in the north store, and Bob Foster, who sold men’s clothing in the south store. Step back in time as you go through the vintage doors and into a store where much of the historic character has been maintained, including the vintage 1911 water fountain located in the archway between the buildings. 18. Bill Ballagh Building; 102 E. Middle St. Some outstanding exterior features of this building include cast iron columns and moldings at the front entrance and curved metal cornices at the roofline. 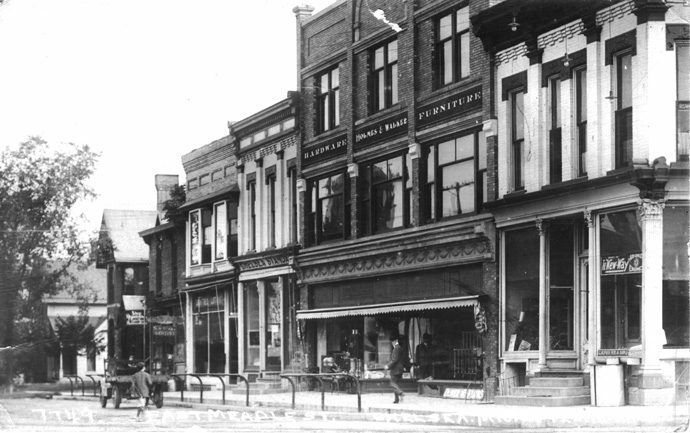 Numerous merchants have occupied this building in the past century including a millinery, Kantlehner’s Jewelry Store, an eye glass shop, a shoe store, a barber shop, an insurance company, and accountant. The window is dressed with ever-changing displays of current events in Chelsea. 19. Municipal Building; 104 E. Middle St. Originally the Holmes & Walker’s general/hardware store thrived here for many years. The building was also occupied by the Chelsea Fire Department, the library, and the Village of Chelsea offices. The third floor was used as a community room, until the Chelsea Police Department took over most of the building between 1970 and 2013. In 2014, the new owner did extensive restoration of the building including a major recreation of the historic storefront, which now houses Moran’s Consigments on street level. 20. Chelsea House Victorian Inn; 118 E. Middle St. This home was built for Lovell Loomis, a local grocer. In the early 1890s it became attorney, cigar maker, and Congressman James Gorman’s house, which he occupied for 30 years. 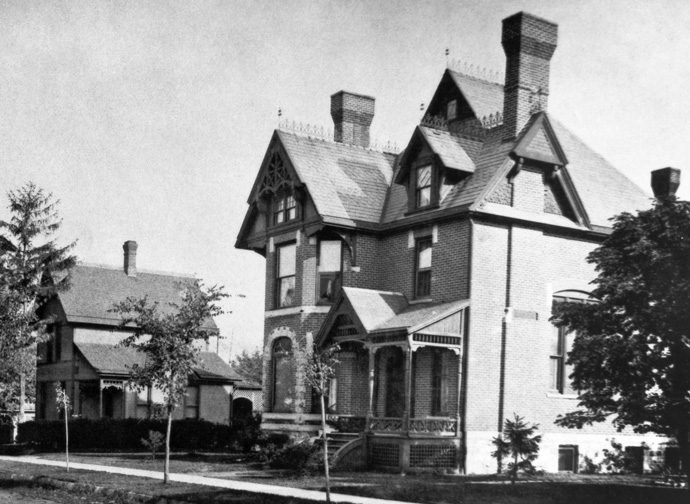 Before becoming a Bed and Breakfast in 1994, Chelsea House Victorian Inn, like many larger homes after the Depression and WWII, had been split up and rented as apartments. If you look three doors to the east you’ll see a “twin” replica home known as the G. W. Palmer House. 21. First Congregational Church; 121 E. Middle St. 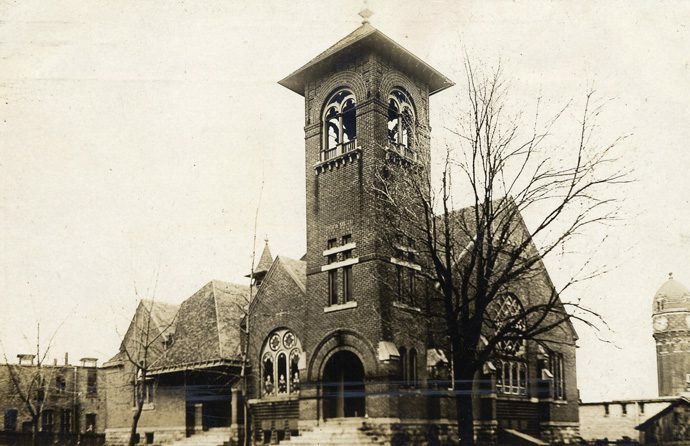 This church was built in 1894 to replace the original wooden structure destroyed by fire. The original 1851 structure had a heated basement which was popular for community events. Thirteen of the twenty nine breathtaking stained glass windows were donated by its members. The Chelsea Alehouse Brewery’s kitchen features many house-made items including tacos,.. When Michigan’s weather can’t make up its mind, you can get your favorite drink hot, iced..
Stop by Common Grill tonight and try their feature cocktails like the French Rose Spritz..
Only two more Wednesdays in April and Cottage Inn Pizza Chelsea is offering a large one..
©2019 Chelsea Area Chamber of Commerce. All rights reserved. 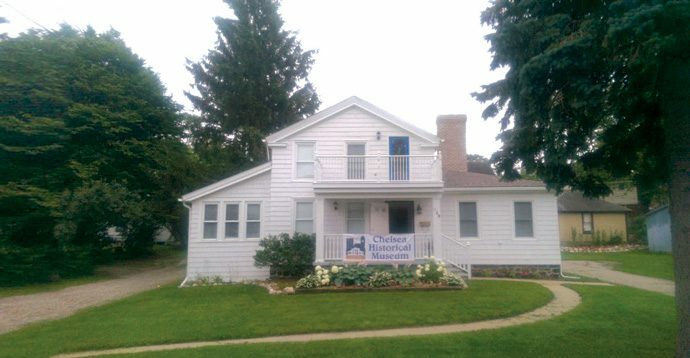 :: chelseamich.com is the official community website of Chelsea, Michigan. Our intiatives are made possible through support from the City of Chelsea and the Downtown Development Authority (DDA), the Chelsea Area Chamber of Commerce, sponsorships and advertising from Chelsea businesses and organizations, and the Chelsea First Advisory Committee.